Nearly twenty years into his solo career, Rick Braun’s done just about everything, from backing the likes of Rod Stewart and Sade to stepping out into the spotlight as a vocalist and a first-class master of the trumpet and flugelhorn. This year, Rick’s getting into the swing of the holiday season with his first-ever Christmas album, Swingin’ In The Snow. Right from the brassy, big band opening of “I’ve Got My Love To Keep Me Warm” to the final muted chord of “Silent Night,” Rick serves up a heaping helping of holiday cheer that’s as warm as a yuletide fire and as cool as the season’s first snow. And while these songs have all been performed and recorded hundreds – if not thousands – of times in the past, Braun imbues them with a freshness that’s as bracing as a winter breeze. Want proof? Check out his neo-bossa take on Leroy Anderson’s “Sleigh Ride,” teaming up with guitarist Peter White for a Brazilian groove. Or check out his sultry, sassy duet with vocalist Mindi Abair on Frank Loesser’s “Baby, It’s Cold Outside.” And nobody could resist Braun’s soulful solo on “Silent Night,” opening out into a gospel chorus led by Jeffrey Osborne, Bridgette Bryant, and Swoop Brown. 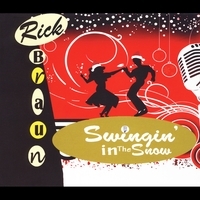 In the holiday spirit of giving, fans can join the Rick Braun fan club at www.rickbraun.com any time before the new year and receive a free four-song EP download of instrumental versions from Swingin’ In The Snow. Also, Rick will be donating one dollar for every Swingin' In The Snow compact disc sold to the Autism Society of America.